(PRLEAP.COM) Frontline Source Group, a principal employment agency in the staffing industry, announced today that they have received Inavero's Best of Staffing® Client and Talent Awards for providing superior service to their clients and job seekers. Presented in partnership with CareerBuilder, Inavero's Best of Staffing winners have proven to be industry leaders in service quality. This award is based entirely on ratings by their clients and the employees for whom they've coordinated job placements. On average, clients of winning agencies are 2.3 times more likely to be completely satisfied than those who have not, and job seekers who work with winning agencies are 1.7 times more likely to be completely satisfied with the services provided compared to those working with agencies who haven't won the noteworthy award. Less than 2 percent of all staffing agencies in the U.S. and Canada have earned the Best of Staffing Award for service excellence. Focused on helping to connect people with the right job openings at US companies, Frontline Source Group received satisfaction scores of 9 or 10 out of 10 from 81.5% of their clients and 74.2% of their talent, significantly higher than the industry's average. "We know that so much of our success comes from the experience we create for our clients and candidates; this award helps confirm we are making the right efforts. We continue to learn what is working best and we take their responses very seriously. We are grateful for the participation and candid feedback we received." Shelly Hubble, SVP said. 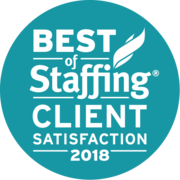 "Our goal is to make service a priority and we are proud and honored to be recognized among the top 2% of staffing agencies for our efforts in this way. It's a strong testament to what our team strives to achieve each day." Frontline Source Group's President and CEO, Bill Kasko said. "With a tight labor market and growing economy, finding the right recruiting partners is critical to success," said Inavero's CEO Eric Gregg. "Best of Staffing winners provide consistently remarkable service to their clients and job candidates, and I couldn't be more proud to feature them on BestofStaffing.com." Frontline Source Group offers both employers and qualified candidates the opportunity to find sustainable employment solutions. Their skilled team of recruiting specialists is instrumental in orchestrating sustainable placements which often bud into careers. This mutually beneficial target has been a cornerstone of their staffing agency since their 2004 inception. Frontline Source Group is simply a superior avenue for employers and top talent to connect with one another. From a candidate's perspective, it is rare to find a staffing agency that offers the level of temporary employee benefits the way Frontline does. From medical benefit options to direct deposit along with holiday and vacation pay, the benefits afforded to their temporary and temp-to-hire candidates are a consistent draw for employing the strongest candidates in each of Frontline's job-placement categories. Industries in which Frontline has a strong placement history include administrative, customer service, accounting & finance, human resources, technology/IT, engineering, and oil & gas. A hallmark of Frontline's method is to tailor their staffing services to the individual needs of their employer clients. Frontline Source Group, a member of the American Staffing Association, offers specialized-skill testing which helps illuminate ideal matches between employers and candidates. Bill Kasko, Frontline's president, CEO, and founder, has cultivated a culture that values work ethic and excellence. Doing the task that needs to be done - and doing it well - has always been Bill's chief aim. The CEO has been known to clean the kitchen, get water for candidates, or answer the phone, all of which contribute to fostering a team-driven and goal-oriented staff. "When we win together, we all win together. When we lose something, we all lose," Kasko says. This is not the nationwide staffing agency's first formal recognition or award either. As recently as 2017, for example, Frontline received the Best of Staffing® Award for service excellence and exceeding expectations. The staffing agency has received a host of other awards commending them for a multitude of virtues, among them being a top place to work and being in the top 5 percent of small businesses throughout the country. The Inavero team administers more staffing agency client and talent satisfaction surveys than any other firm in the world, reporting on more than 1.2 million satisfaction surveys from staffing agency clients and job seekers each year. Committed to delivering ongoing value to the industry, Inavero is proud to serve as the American Staffing Association's exclusive service quality partner. 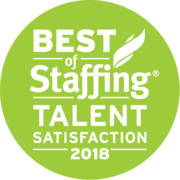 Inavero's Best of Staffing® Award is the only award in the U.S. and Canada that recognizes staffing agencies that have proven superior service quality based entirely on ratings provided by their clients and job candidates. 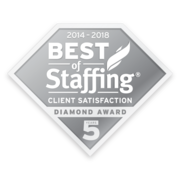 Award winners are showcased by city and area of expertise on BestofStaffing.com – an online resource for hiring professionals and job seekers to find the best staffing agencies to call when they are in need. © Copyright 2018, Inavero, Inc. All Rights Reserved. 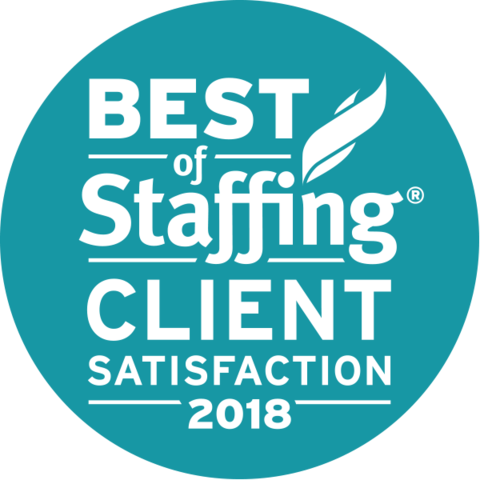 Inavero's Best of Staffing® is the nation's only award that recognizes staffing agencies that receive remarkable reviews from their clients and the people they help find jobs (employed talent). Best of Staffing guides businesses and talent in their search to find he best staffing agencies to call when they are in need. Inavero administers more staffing agency client and talent satisfaction surveys than any other firm in the world. Inavero's team reports on satisfaction surveys from more than 500,000 staffing agency clients and talent each year and the company serves as the American Staffing Associations exclusive service quality partner.